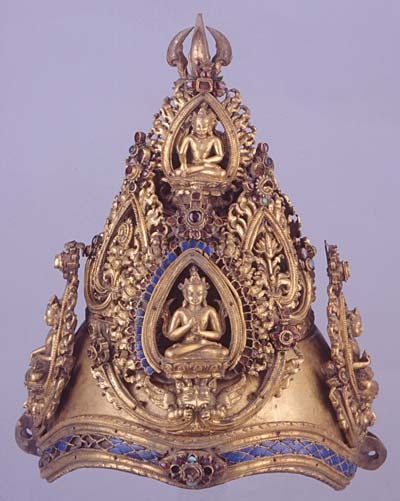 The top of this conical-shaped piece is embellished with a half-sized thunderbolt-diamond (vajra). Fragments of semi-precious stones have survived from the original decoration and are still visible. Around the piece, like a mandala, are finials depicting either figures of jina, or the “victorious” Buddha, in permanent meditation and each performing his own specific canonical gesture (mudra). These are swamped in a lush, detailed decoration of plant motifs. On the lower band, a Sanskrit inscription bears a date corresponding to 1145. The tiara was made from a sheet of pure copper, worked in repoussé and then gilded using a mercury amalgam technique. Some specimens are cut into finials and pierced. Additions such as the thunderbolt were cast using the lost wax technique. In Nepal, this type of tiara was worn by Tantric masters during religious ceremonies. Its shape is reminiscent of the chignon headdresses worn by certain supreme bodhisattvas and the Buddhas with whom the officiants identified. Nepalese art was essentially the work of an ethnic minority, the Newar, concentrated in the valley of Kathmandu. This people boasted highly skilful and creative goldsmiths whose works drew on the classicizing esthetic of the late Licchavi (350-740) period. Among other features, their production was characterized by the use of semi-precious stones for decoration, crowns, and jewels. In the Nepalese kingdom, artistic inspiration from foreign cultures was assimilated into local tradition. The Licchavis, who came from the north of India, arrived in the country during the 3rd century AD, introducing an artistic tradition that drew on Indian, but also Tibetan sources before culminating in a distinctive Nepalese art.